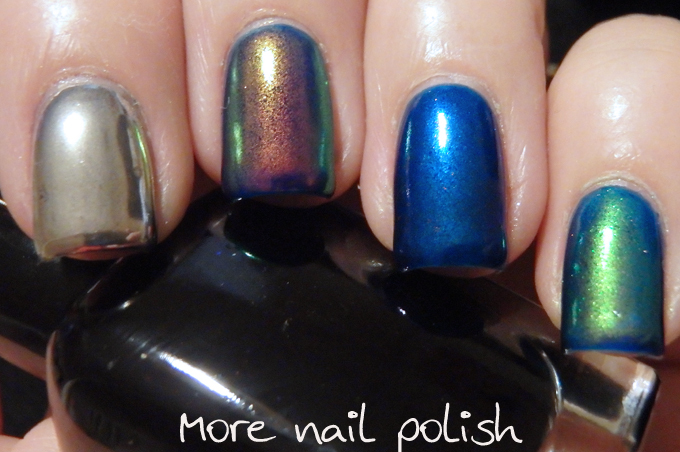 The Polish Chrome Wars - Rub all the things into your polish! Chrome nails are THE it thing at the moment. Every second video you see on Instagram is someone rubbing that silver powder into their polish. Of course there is a good reason for this, it's freaking cool! Not just the finished product (which looks awesome) but the application process is fun and magical. After getting my chrome mirror powder in the mail I realised that this rubbing or 'burnishing' technique, where you polish some sort of powder into your polish, could be used with a whole bunch of things. So I pulled out a whole bunch of things that I had in powder form and played. I already had a blue gel polish base on. Specifically Dance Legend 'My December'. Its a juicy jelly blue gel polish, but because of it's jelly appearance I felt I needed three coats to have enough opacity. Let's look where I started. First up, the chrome powder. This is the one from Daily charm. I like it a lot, this is the number 03 one, which is the finest particle size with the least shimmer and most mirror like finish. 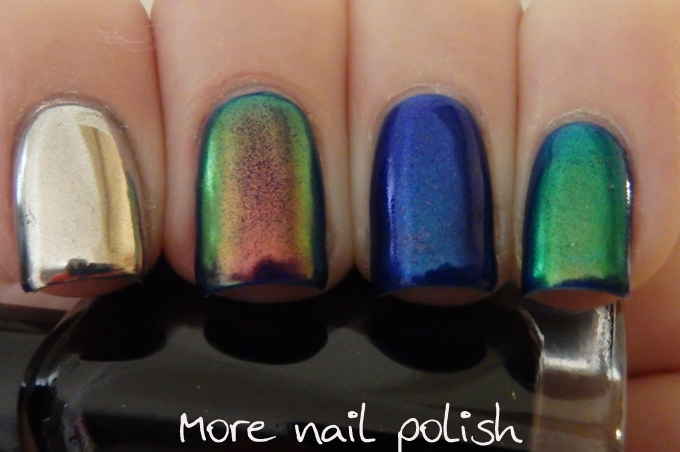 The next three fingers have three different chameleon pigments. Specifically the ones that I sold in little one gram jars about 5 years ago. (No I don't have anymore to sell so please don't ask). I kept a few grams of the powders for myself because I knew I'd want to use them for something, and here you go. Middle finger is the red to green powder (which had the best effect in my opinion). Ring finger has the green to blue and pinky has the gold to green. All these show one rubbing of the powders into the gel. No top coat on the chrome, but a layer of seche vite over the chameleons. Next I tried some glitters. Middle finger has the silver flake glitter that is used in all those really reflective polishes. Ring finger is gold holo glitter and pinky and silver holo glitter. These are the ultra holo glitters from Glitter Unique. The silver flake didn't work so well, but I did love how flat the gold and silver glitters were. They would obviously be much better over a closer matching base rather than dark blue. 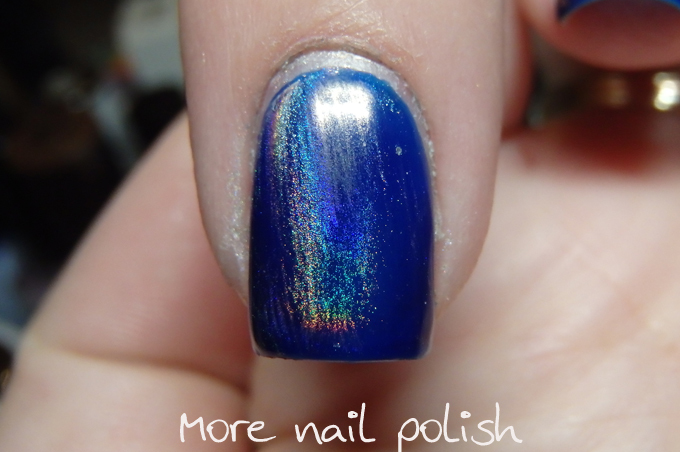 Next I wanted to try holo. 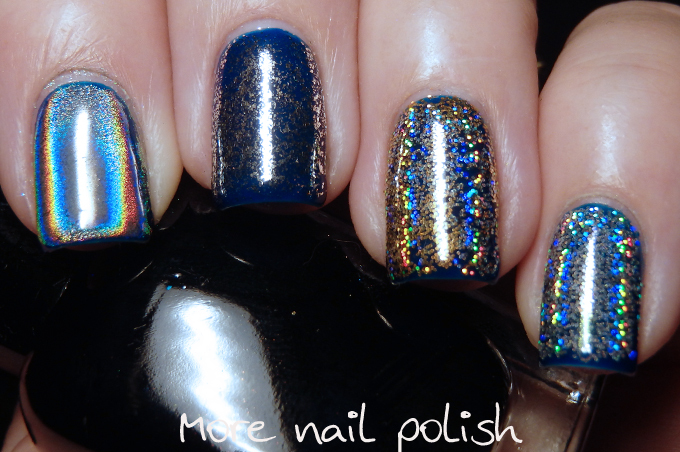 Because the next thing we are going to start seeing in about a month, is everyone rubbing holo powder into their nails. Yes, I caved. I forked out the ridiculous $40USD for a single gram of the holo powder from Daily Charme, which is currently on sale as a pre-order only. I hope to have it in my hands in about a month. But in a effort to try create that effect now, I pulled out some stuff. Firstly Spectraflair. I've still got a little stash of spectaflair in powder form, again because I used to sell the stuff before JDSU changed their requirements so that it could only be sold pre-mixed in suspension base. So using as much caution as possible, and noting that the product is not cosmetically approved, I tried rubbing some into my gel. FAIL. I could not get it to adhere. I got a tiny bit on there, but it kinda sucked. Note that I'm not using a wipe free top coat, so I don't know if I'd get better results with Spectraflair if I were using that sort of top coat. After doing all that experimenting on gels, I peeled them off (cause I cleverly remembered to put on a layer of Picture Polish peel off base coat). I then applied a full mani in Emily de Molly Iridescent Skies. Here's a bonus swatch photo of that! I applied a layer of Seche Vite and let it dry to about 80%. It was still dentable but wouldn't leave finger prints. Then I gently rubbed away, and I didn't have to rub hard for it to adhere to the top coat. OMG just look at it. I'll edit a video at lunch tomorrow and upload my rubbing to instagram. So make sure you are following me there! This first photo is straight after application. with no top coat. Below is my final mani. You do need to apply top coat otherwise the powder does eventually rub off. I applied Seche Vite. I found it did reduce the holo intensity a little bit, but nothing too major. 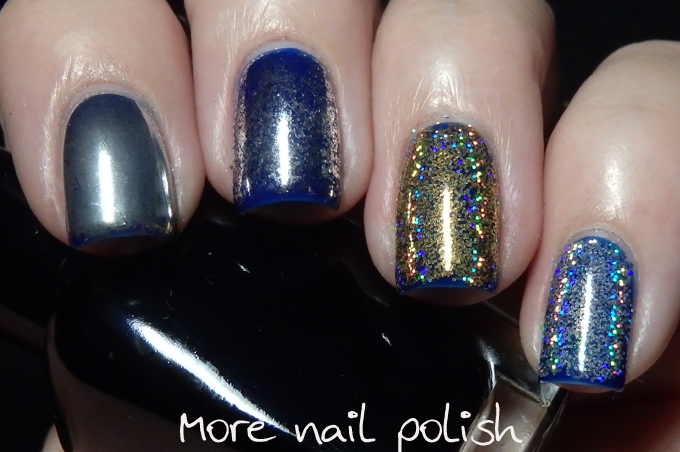 I then rubbed in another bit of the holo flake and made a holoflake sandwich with the top coat. 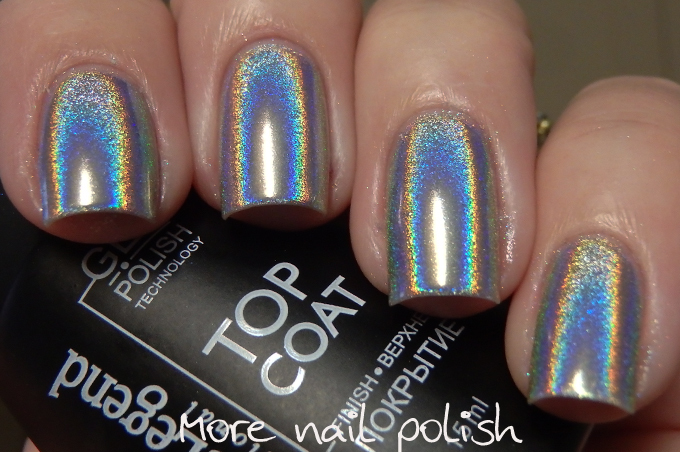 This lasted really well and the holo was strong. I didn't apply a gel top coat because I didn't feel like doing the whole soak off thing, as I hadn't applied the peel off base. 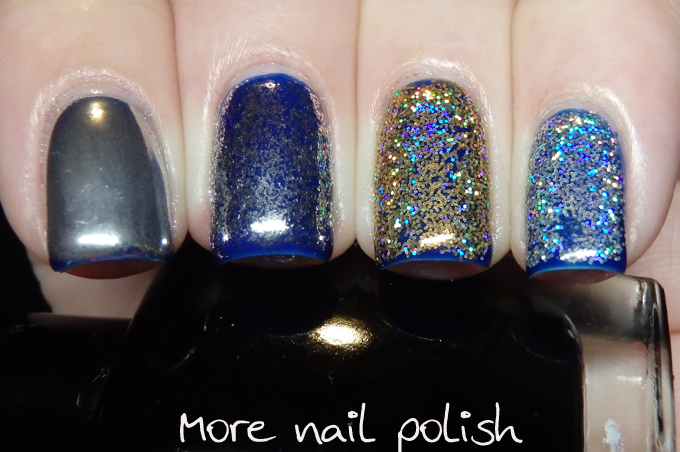 But I'm confident that a gel top coat would keep the holo just as well, if not better than the Seche Vite does. I've got some more fun things coming with the nail polish chrome wars, next installment will be a comparison of the chrome powder with the Born Pretty Store mirror polish. OMG cause someone already said WOW! Can't wait for your continuing posts on these powders. Hopefully one of the US ladies will find a comparable Joss product 'cause I really don't want to pay $40! 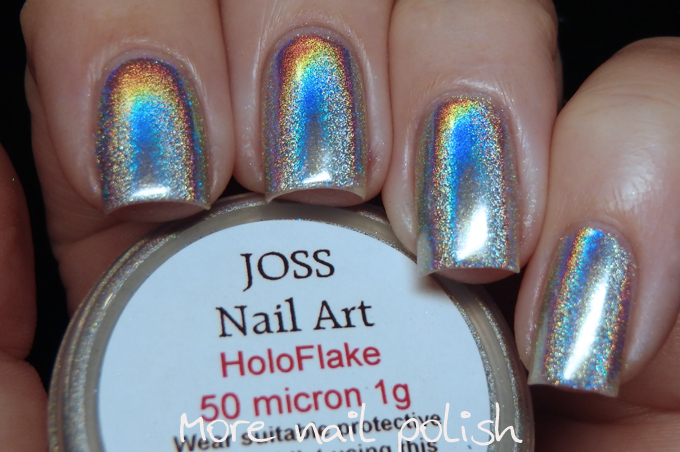 Oh my word, that holo! BAM! AMAZING! Great post, seriously. I wish I could get that Joss stuff! Interested to see how that holo powder you pre-ordered compares! Still waiting to get the born pretty stuff. I don't even have shipping notification. Their CS is pretty crap! Great post! Thanks for this! I do have a question: did you top coat the chrome and if so have you found a top coat that works best? I tried using gelish top coat and the next day it peeled off over the layer of chrome and then the chrome finish rubbed off throughout the day. I tried seche vite but haven't tried others. Seche made it sparkly and not chromey any more. The gel top coat worked, but I haven't tried either an aqua top coat or any others. They were selling 1 gram samples but literally stopped just when people started to explore just how fantastic the effect can be using burnishing and a non tack gel (there's a youtube tutorial by 10 Little Canvases that shows the DidSpade pigments in action). It's like been given a glimpse of something super amazing that you immediately race to find, only to be told it's no longer available and that it will never. be. restocked. I'm super curious to see what you think of the various chrome powders out there- I initially grabbed the born pretty chrome powder but I know it won't be as fine as the nicer versions so ended up ordering Chromageddon too (bonus; it looks fantastic over colours as well). Just what I needed to know...that it can be done with Seche (or other regular top coat), not just gel top coat! Thank you!